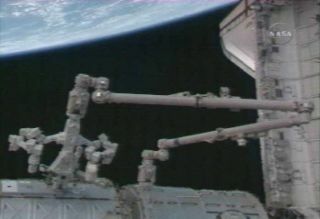 The International Space Station's Dextre robot is shown attached to the U.S. Destiny lab via a camera on the orbiting lab's exterior. Thisstory was updated at 9:21 p.m. EDT. HOUSTON -The International Space Station?s (ISS) new mechanical maintenance man officiallymoved in Tuesday when astronauts attached it to the exterior of the orbitinglaboratory?s U.S. Destiny module. Until today,the Canadian-builtrobot Dextre remained fixed on the platform that ferried it to the ISSinside the cargo bay of NASA?s shuttle Endeavour. But after three separatespacewalks to add hands, arms, camera eyes and a tool belt of sorts to themassive robot, Dextre is settled onto its new orbital residence. ?Dextre isnow grappled the lab?s grapple facility,? said ISS flight director Kwatsi Alibahuroin an evening briefing here at NASA?s Johnson Space Center. Built bythe Canadian Space Agency, Dextre is a 3,440-pound (1,560-kilogram) robotdesigned to fill in for astronauts to replace batteries and perform otherroutine repair jobs that would otherwise expose a flesh-and-blood spaceflyer tothe added risk of a spacewalk. Its two 11-foot (3.4-meter) long arms are tippedwith hand-like grippers sensitive to light touches, can lift up to 1,323 pounds(600 kg) and position hardware with an accuracy of about 1/12 of an inch (2mm). ?He lookslike a gunfighter with his sidearm raised,? shuttle commander Dominic Gorie saidearlier today as he described the two-armed Dextre to Mission Control. The$209-million robot is Canada?s latest addition to the ISS, where it joined itssimpler Canadarm2 cousin and a railcar-mounted work platform known as theMobile Base System. Astronautsplucked the 12-foot (3.7-meter) tall Dextre free of its cargo pallet crib earlyTuesday using the station?s Canadarm2 robotic arm. They left the robot hangingout in space overnight and attached it to a grapple point on NASA?s Destinylaboratory at about 7:59 p.m. EDT (2359 GMT) tonight after performing somefinal tests. About theonly glitch came when astronauts commanded the robot to pivot on its waistjoint. Instead ofmoving in the expected direction, Dextre turned in the exact opposite way,Alibahuro said. The glitch is minor and may be due to a simple, yet errant,minus sign in one of the robot?s computer files, he added. Dextre?selectrical hardware and arm joint brakes have already passed their own systemchecks, mission managers have said. ?We got itall up and running, so Dextre is alive,? Endeavour mission specialist RobertBehnken said this week. Behnken andcrewmate Rick Linnehan outfitted Dextre with waist-mounted cameras and tool kitplatform duringa Monday spacewalk to prepare the robot for its move to the station?s hull.Two earlier spacewalks delivered the robot?s hands and arms. With Dextrestowed on the Destiny lab - where it is expected to stay through at leastNASA?s next shuttle mission to fly in late May - astronauts aboard the ISS willretrieve the robot?s carrier platform from a perch on the station?s firstportside truss segment and return it to Endeavour?s payload bay for the triphome. Theastronauts are also due to take a few hours off tonight to catch their breathas they pass the midpoint of their 16-day construction mission to the ISS. Thatoff-duty time is scheduled to begin at about 12:28 a.m. EDT (0428 GMT)Wednesday morning. In additionto delivering Dextre, Gorie and his crew have swapped out one member of the station?sthree-person crew and installed the first piece of Japan?s massive laboratoryKibo (Japanese for ?Hope? ), anattic-like module, for the Japan Aerospace Exploration Agency. Theastronauts are also slated to test a shuttle heat shield method that uses aspace age caulk gun to fill in dinged belly tiles with a pink ablative gooduring a Thursday spacewalk, then inspect the station?s balky starboard solararray joint in a Saturday excursion. Alibahurosaid mission managers are also planning to call on Endeavour?s spacewalkingteam to reattempt the installation of a stubborn materials experiment to theISS exterior during their Saturday spacewalk. Astronauts had trouble trying to installthe experiment in a Monday spacewalk. Endeavourand its seven-astronaut crew are in the midst of a record-long constructionflight to the ISS. They are due to depart the station on March 24 and return toEarth in the evening of March 26. NASA isbroadcasting Endeavour's STS-123 mission live on NASA TV. Click here for SPACE.com'sshuttle mission coverage and NASA TV feed.